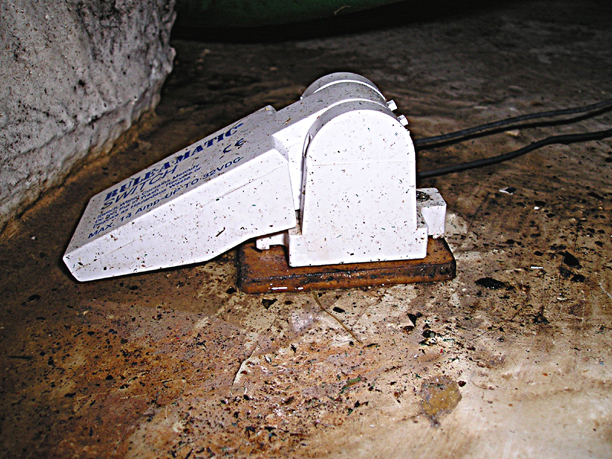 When I first uncovered and inspected Chip Ahoy (then still named "Take Five"), I was astonished to find it had no bilge pump. 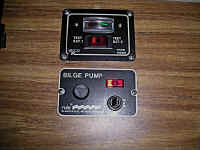 Every boat I've ever owned or sailed on has had a bilge pump! I set about installing one. 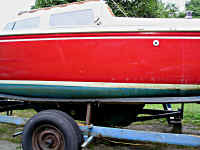 The first step was cutting a 1-1/8" hole in the hull and installing a thru-hull fitting (sealing it on both ends with 3M 4200). 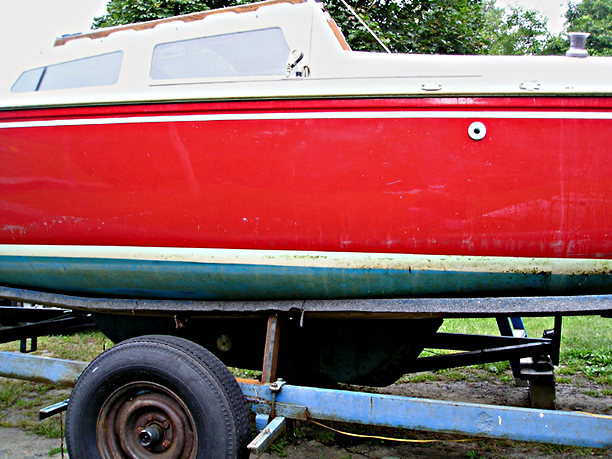 I put it as high above the waterline as possible, with a plan to bring it even higher. 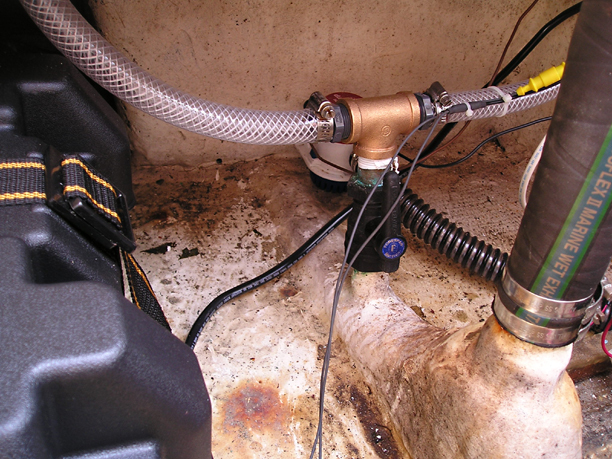 Next, I mounted a Rule 1100 (GPH) pump, fastening it to the aft bilge bulkhead behind the "volcano," beneath the cockpit liner, and attached 10' of 1-1/8" hose. 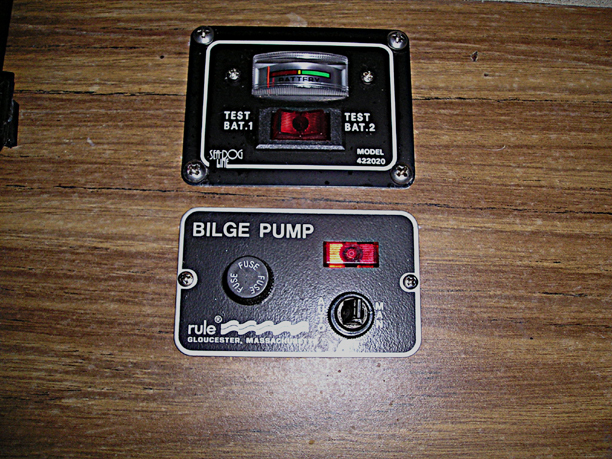 Note: In the May 2009 issue of MainBrace (the bimonthly publication of the Catalina 22 National Sailing Association for which I am its technical editor), my article was titled "The Bilge Pump Debate." 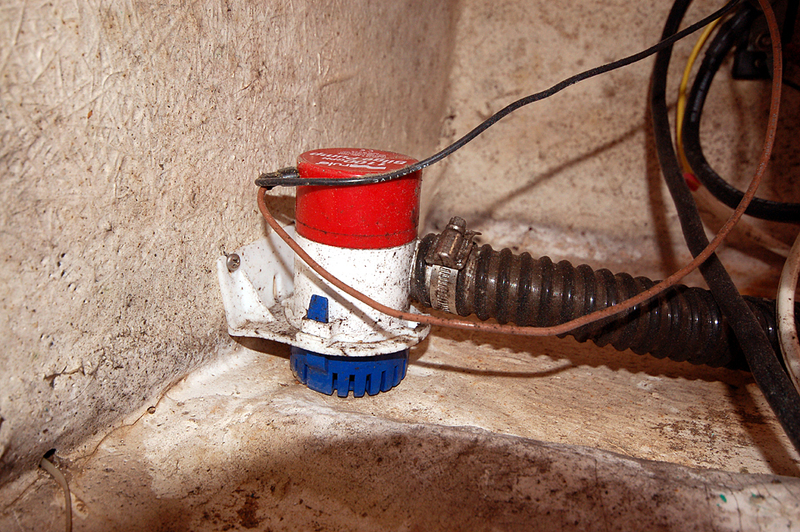 I took some new photos of the bilge pump setup for it, which I've added here and below. 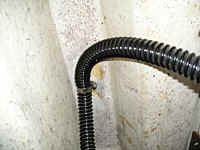 Photo taken in 2004, after installing a second battery and replacing the scupper drain hoses and hull fitting. I epoxied a small piece of plywood to the interior hull immediately behind and as close to the cabin liner as possible (the lowest point of the aft bilge), then fastened a Rule float switch to it. Note the small piece of closed cell styrofoam I subsequently glued to the bottom of the lever, to compensate for the piece of plywood raising the float switch. I cut a 1-1/8" hole in the port side bilge bulkhead liner beneath the aft settee seatback and ran the hose around and up through it. 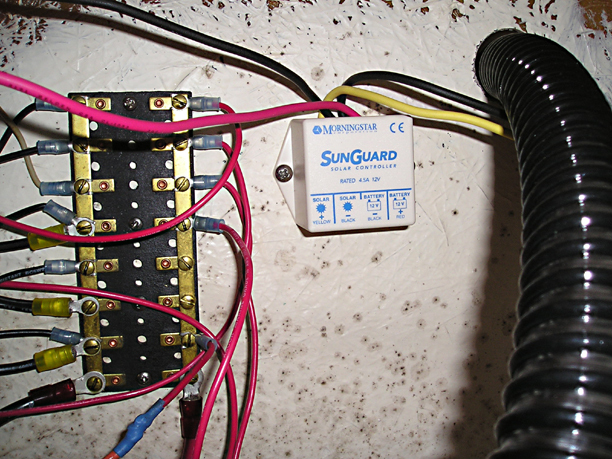 Another view, the photo taken after installing a small buss and a solar panel controller. 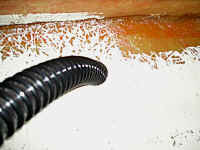 From there, I ran the hose up to the interior top of the coaming and attached it to a fair lead/eye-strap, with the eye-strap's screws entering from the outside topside (see photo below), and ran a hose clamp through the eye-strap lead and secured the hose. 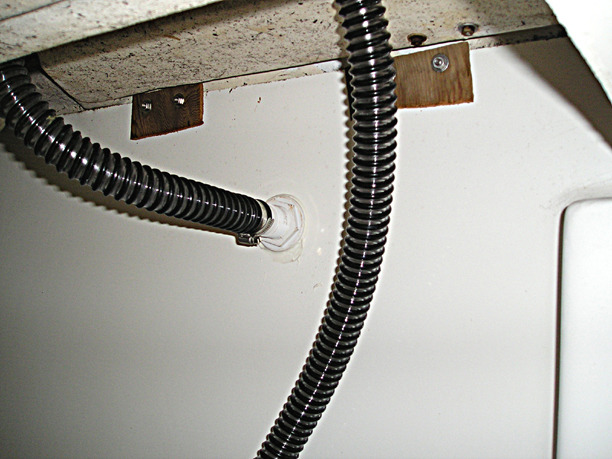 A view of the screws with finishing washers holding the eye-strap below deck. 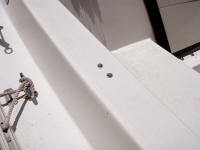 What a difference a wide-angle lens makes in capturing a larger area! I used the Sigma EX 10-20mm on my Nikon D50 DSLR for the MainBrace (May 2009) photos. 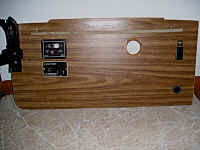 The other photos on this page were taken with an Olympus pocket camera that's always onboard, usually within reach. 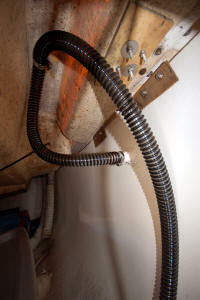 Then I dropped the hose down to the thru-hull fitting and fastened it. This and the previous steps prevents backfill, as it requires a higher outside water level than the thru-hull fitting: even on a starboard tack with the portside rail awash the ocean doesn't infiltrate into the bilge until and unless the coaming is under water and the cockpit is filled. (I used a heat gun to soften the hose end enough to squeeze it over the fitting, then hose-clamped it.) 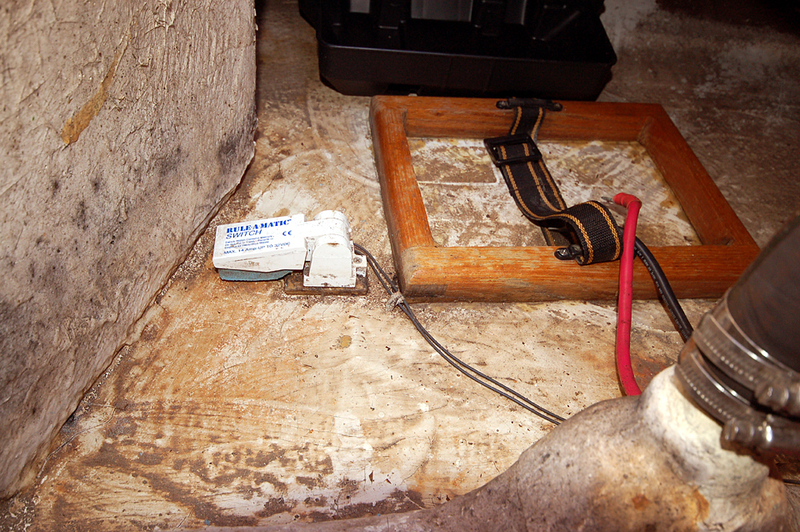 Through the new hatch access door I later had built, I'm able to easily access it if necessary from behind the aft settee seat cushion. 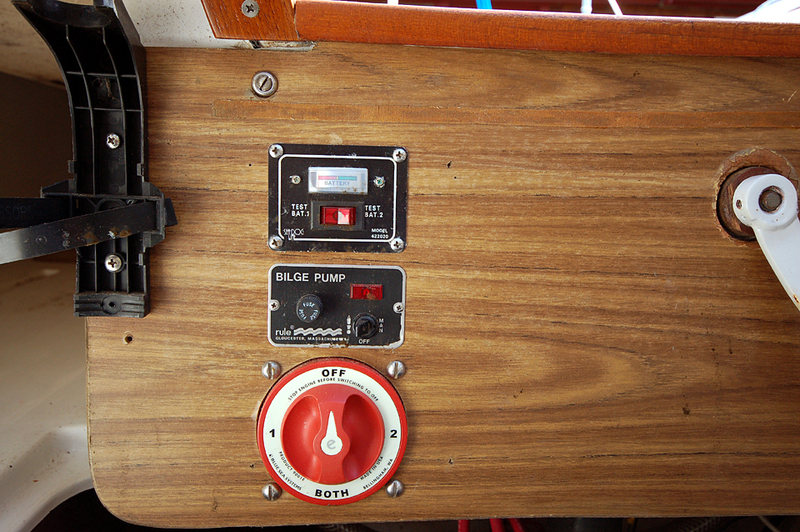 Finally, I added a Rule manual-automatic bilge pump switch to the panel behind the companionway step and wired everything up. 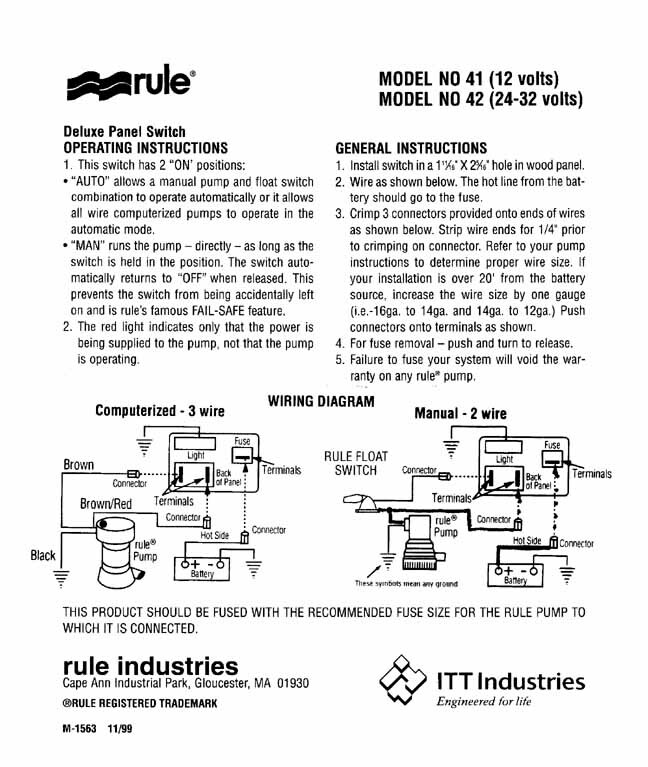 A closer view of the panel switch. 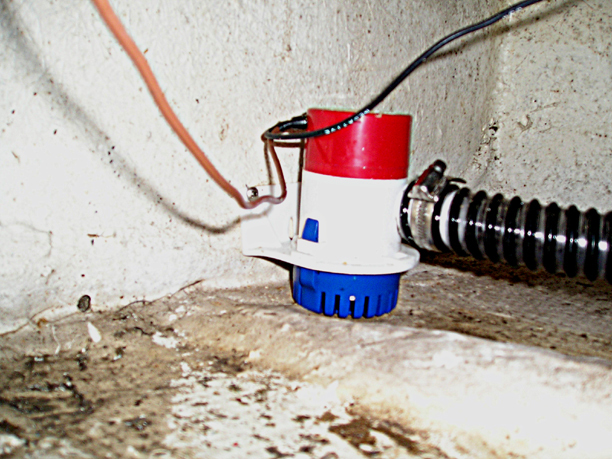 May 2009 The voltmeter switch is at the top, the bilge pump switch in the middle. 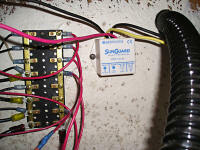 Beneath it is the 4-way selector switch for controlling the two batteries, which I added in 2004. 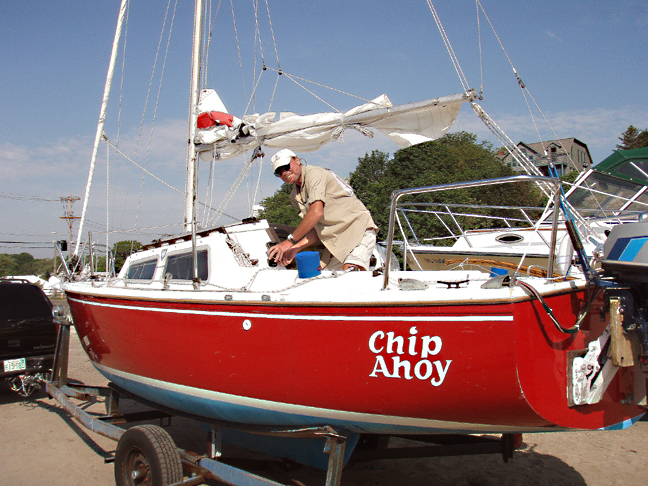 Chip Ahoy being readied for imminent launch in 2006. The bilge pump discharge fitting is just beneath the cove stripe below me in the photo.